The flowers for this Great Fosters winter wedding ceremony and reception are my favourite winter wonderland wedding theme of all time. All photos featured in this blog are curtesy of the very talented Segerius Bruce Photography, who captured the essence of this wedding just so well. 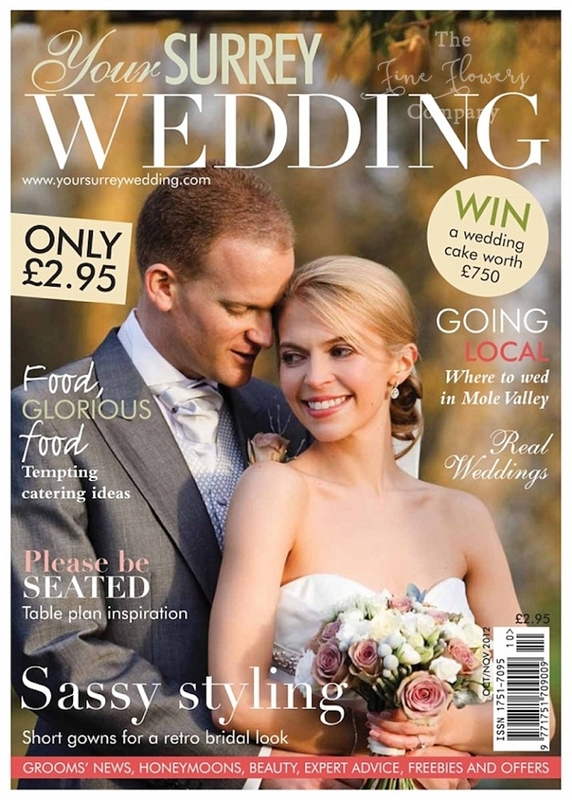 The wedding was featured in Your Surrey Wedding Magazine. 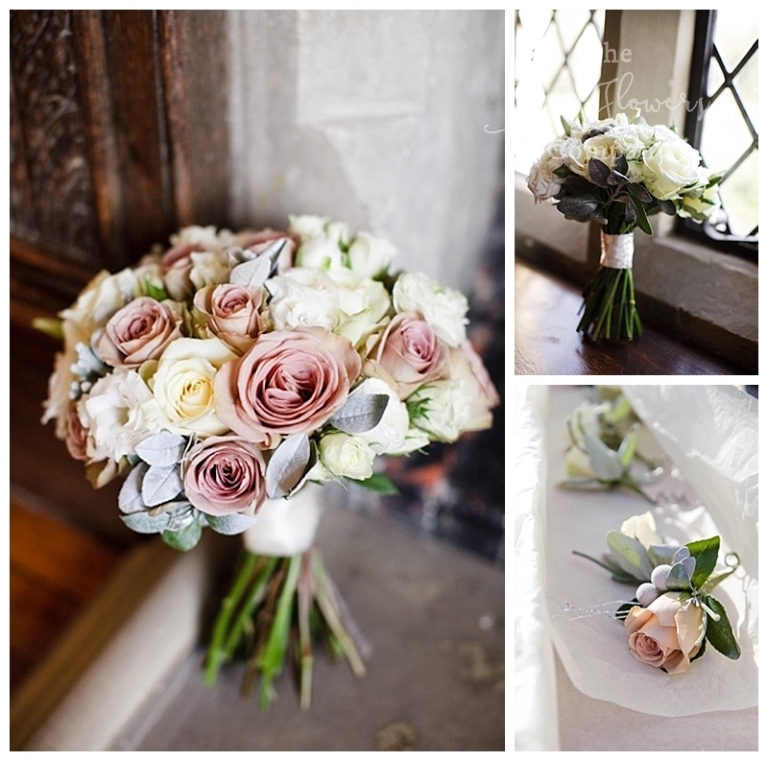 The bridal bouquet looked stunning against the vintage bridal dress, with a mix of frosty Avalanche roses, pale vintage pink Amnesia roses, ranunculus, lisianthus and silver brunnia berries. 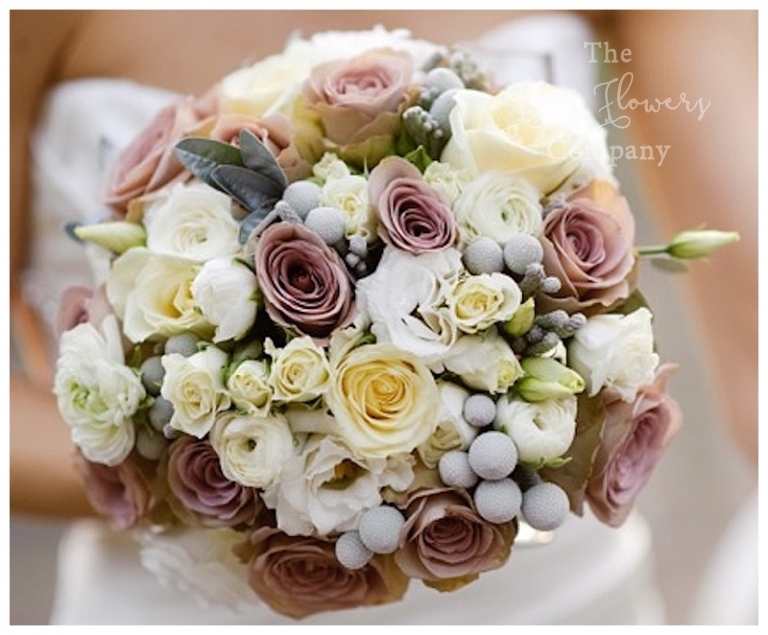 The bridesmaids had matching ivory versions of the bridal bouquet, accented with silver senecio foliage and again, silver brunnia berries. This Great Fosters Winter Wonderland themed wedding started off in the Orangery for the wedding ceremony, then moved on to the Tithe Barn for the wedding reception. For this stunning Great Fosters Winter wedding ceremony we dressed the Orangery with 4 dramatic wintry candelabra displays and scattered white rose petals amongst hurricane vases on the aisle. The Great Fosters winter decorations were also up in the room and added to the wintery all white effect – the ceremony area looked amazing. For the Great Fosters Winter Wonderland reception in the Tithe Barn, nothing could be more perfect than our elegant silver candelabras, adorned with just masses and masses of winter white flowers. No green foliage diluted the flower displays at all, only using white ferns and sparkly white twigs, for a look reminiscent of recent snow fall and Narnia frostiness. The large and opulent amaryllis in the displays looked amazing amongst lots of roses, lisianthus and spray roses. The candelabras looked amazing when the candles were lit, and created the most romantic ambiance I have seen in a long time. 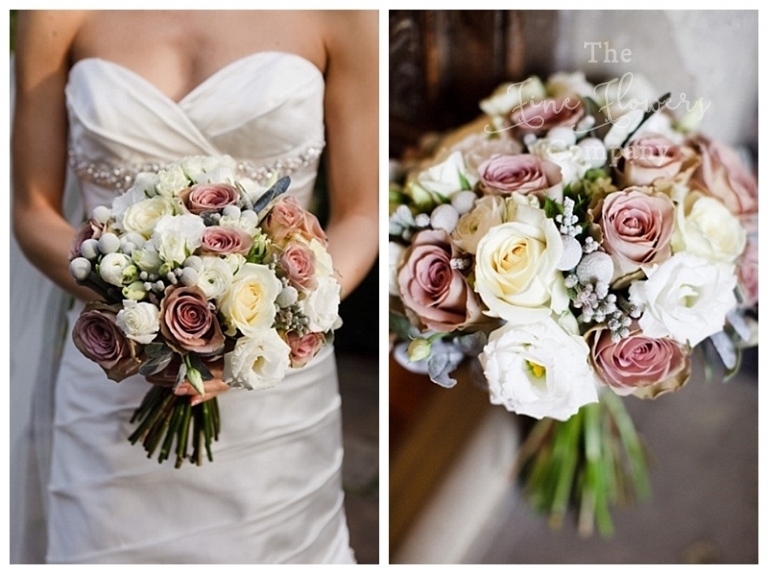 I loved the way the only concession to colour was for the bridal bouquet, with addition of vintage pink Amnesia roses to add contrast against the vintage dress but still have a frosty white wedding look.